There are so many benefits to buying a used Chrysler, Dodge, Jeep, Ram at Stanley Chrysler Dodge Jeep Ram Brownfield. We offer a continually rotating stock of quality used vehicles with the features you want, so you can save money on the pre-owned RAM truck or an off-road ready Jeep Wrangler you have been looking for. Explore our online inventory and then stop by our Brownfield dealership when you find a winner. Which used Chrysler, Dodge, Jeep, Ram is right for you? What is your budget? : Set a budget before you start looking so you don’t stretch yourself too thin. What are your needs? : Do for a workhorse truck for your business or a family friendly minivan for chauffeuring kids? What are your wants? : Create a list prioritizing the features you are looking for and the ones you can compromise on. Where do you live and travel with your vehicle? : Consider the climate and challenges your vehicle might face. Looking to save a little more on your used Chrysler, Dodge, Jeep, Ram vehicle? 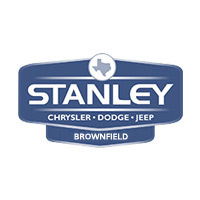 Don’t miss our pre-owned vehicle specials at Stanley Chrysler Dodge Jeep Ram Brownfield near Lamesa.